When my acupuncturist said that I needed to start incorporating black sesame into my daily diet I was initially all “No problem, I’ll sprinkle those suckers on everything!” And then she clarified: I need to eat at least a tablespoon of them a day, toasted and ground, a little honey for sweetener. A consummate over achiever I of course developed a recipe for tasty snack bars to make the tablespoon a day go down with a happy face. And man, I’m so glad I did- they’re crazy good! An aside: If you’re interested in these sorts of things, read about the health benefits of black sesame here. 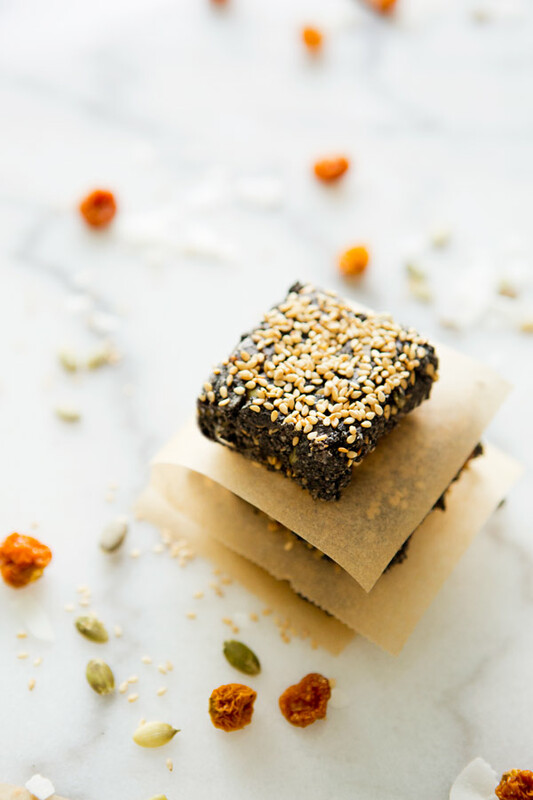 If you prefer the short and sweet of it, here it is: black sesame seeds are crazy good for you and MAY TURN YOU INTO A UNICORN! I know!!!!! So, do yourself a favor. Make these bad boys. Then eat them. You will be so happy you did! – Lightly oil a 7X10″ pan with coconut oil, set aside. – In a high powered blender grind the sesame seeds into a powder. Don’t worry if it’s not perfect, as long as it’s 90% ground you’ll be good to go! – Spread mixture into a pan, flattening with the back of a spoon, spatula or rice paddle. Sprinkle generously with white sesame seeds. – Refrigerate and let set for at least one hour. Cut into 12 bars. Notes: If you haven’t tried Goldenberries you are in for a major treat! They’re the perfect combo of sweet and sour, I can’t get enough of them. And they’re a superfood, so there’s that who becoming a super hero thing. If you’re not interested in Goldenberries, dried cherries or cranberries might be a good substitute! I am curious if you are following "seed cycling." Have you heard of it?? These sound absolutely delicious. I think I need to start incorporating black sesame seed into my daily diet as well! These bars will do the trick! I am so excited to make these! I just bought a huge thing of black sesame seeds without even knowing they were so healthy. I'll be making these suckers today! these look great! 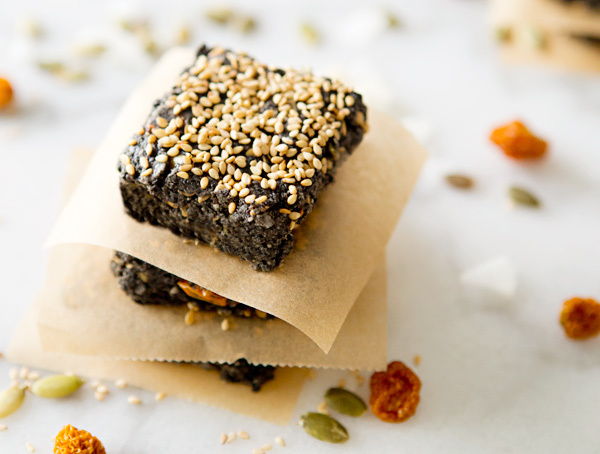 i love that you took the 1 tbsp of sesame seeds as a challenge to make something so fun and delicious to eat. are you planning on talking more about why you are seeing the naturopath and why they are suggesting you eat more nuts and seeds? i'd love to hear about it! um reverses gray har???! SOLD! @Tracy- I don't know what seed cycling is but I'm totally curious! Tell me!! 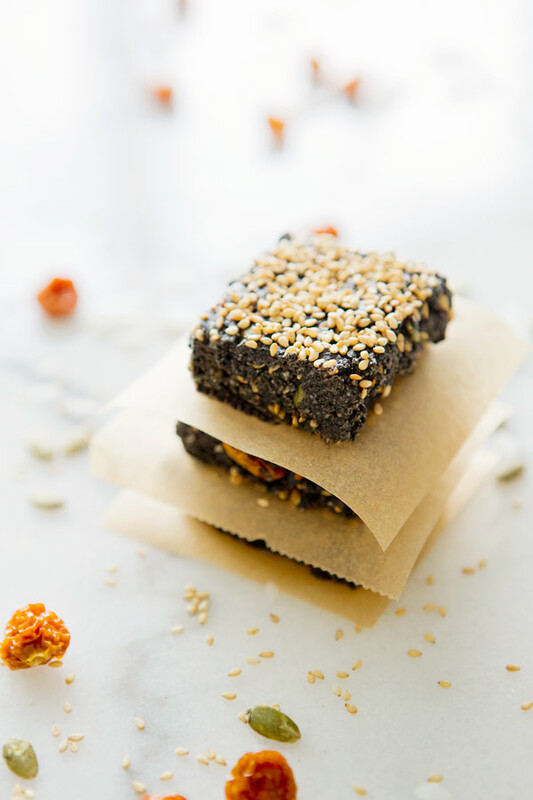 I just bought a bag of black sesame for similar reasons, and I cannot wait to try these amazing looking bars! Thanks so much for the recipe; I'll be sure to share it with my ayurveda community! what an awesome dish……:) definitely going to try this one at my home……. This look really good! Is the flax seed ground, or whole? @amanda- I used whole seeds! I made these and they're freaking delicious. I'll admit mine didn't set up very well ( I think I skimped on the coconut oil too much and I used large coconut flakes instead of the finely shredded kind which are stickier). But the flavor is amazing and I'm digging it crumbled over my coconut milk yogurt. Love it. I had never even heard of black sesame seeds or golden berries before this. Your blog is a constant source for new foods and ideas. Thank you! Hi Sarah! You are such an amazing source of inspiration! I was curious after reading more about the seeds and how they darken dark hair – do you have any idea whether they will darken naturally blond hair? Thanks! Thank you for this wonderful recipe – my family just loves it! I used acerola cherries and cranberries and it tastes great. @Katherine- I have no idea, I hadn't read that! how crazy! I made these yesterday and they are fantastic. So much flavor! Thank you for sharing… these will definitely be a staple going forward in my home!